The dog days of summer are here with its friend, humidity central. The next couple of months will continue to bring high temperatures, and that definitely won't keep couples from celebrating in the sunshine! With the heat, there are many ways for you to help your guests cool down, especially if you're having an outdoor ceremony or reception. And we have one super chic and easy-to-make must have for your cooling station! 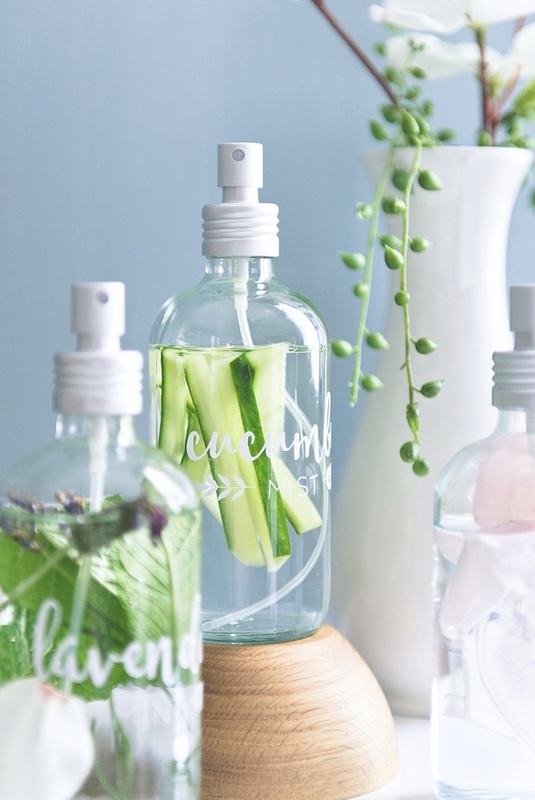 Enter herb-, floral-, and veggie-infused water misters! 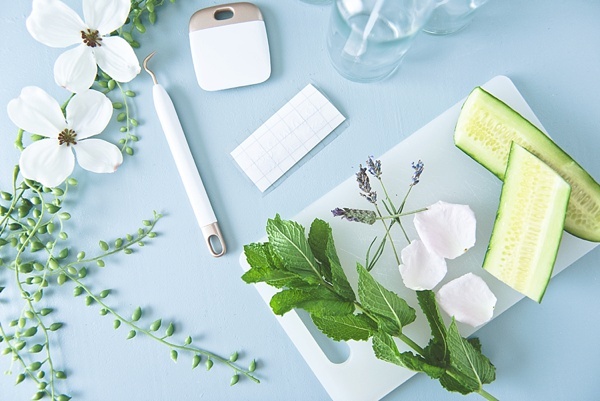 Inspired by skin sensitivity awareness and the healing powers of nature, we've created some simple facial mist recipes for keeping your loved ones fresh and chilled while they dance the night away. 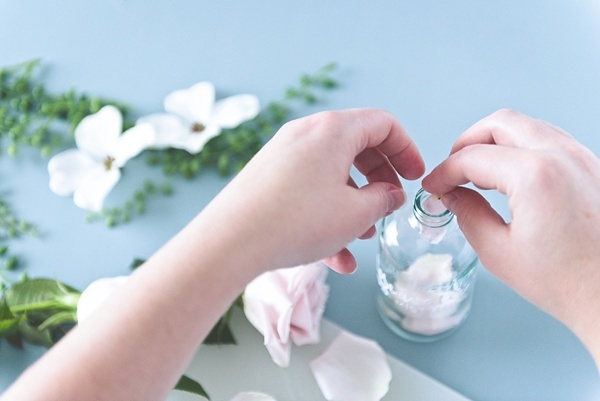 Special Note: For this particular tutorial, we have omitted essential oils due to skin sensitivities that could be amongst a large group of wedding guests. We wanted to keep it totally au naturel just like fruit-infused drinking water! There are great recipes on Pinterest though if you choose to include oils in your own misters! Be sure that your essential oils are food- and cosmetic-safe. 1. Using your electronic cutting machine (our preferred choice is Cricut! 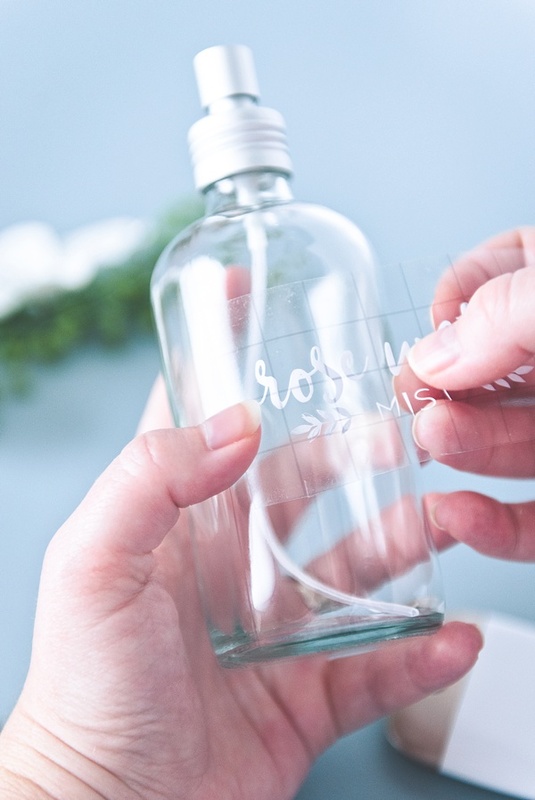 ), cut out your pre-designed bottle labels and burnish them onto your glass bottles with your scraper tool. You can do this part anytime in advance of the big day! 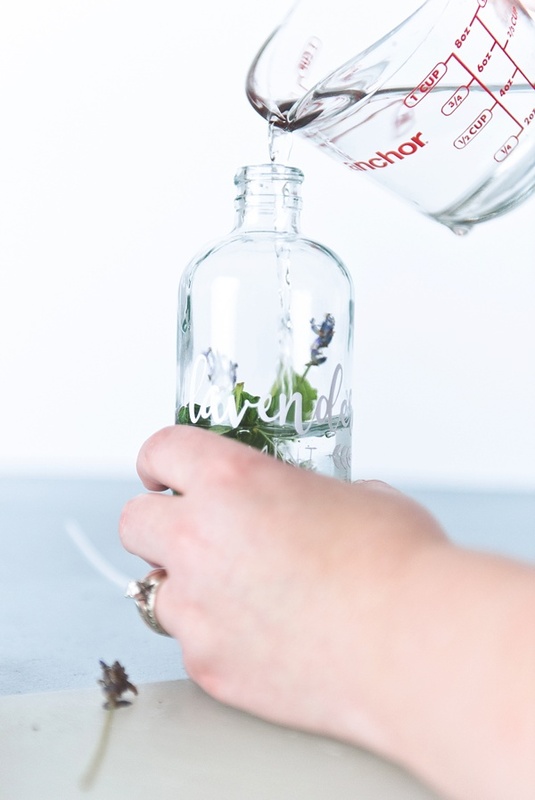 However, because of the lack of preservatives in the natural ingredients, we do recommend making your actual infused water concoctions the night before the wedding and storing them in the fridge. DOWNLOAD OUR LABELS: Want to grab ready-made designs for free? 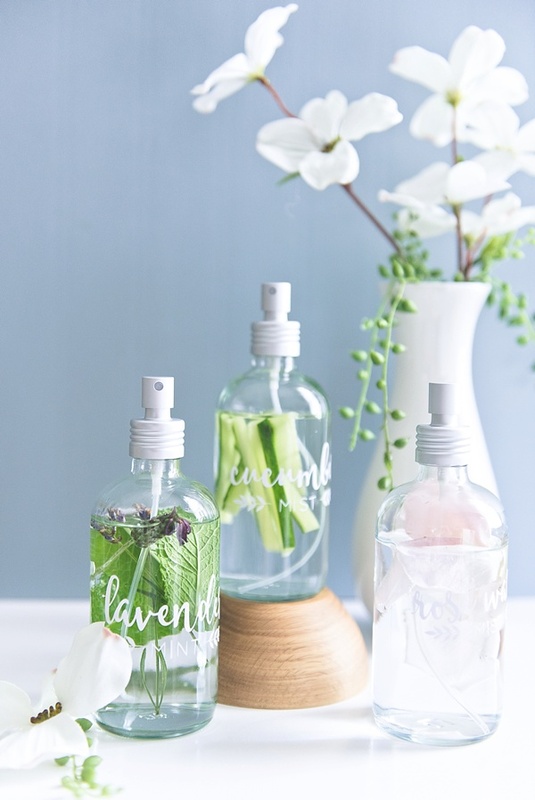 You can save these Lavender Mint, Cucumber Mist, and Rose Water Mist labels and then upload them into your online cutting design studio. Because of the delicate details used in ours, we recommend having a fresh cutting blade in your cutting machine. You may also find the "i" in mist/mint might be a bit of a nuisance. If yours disappears while weeding like ours did, just use some scissors, cut off a very slim piece of your vinyl, and replace it! 2. 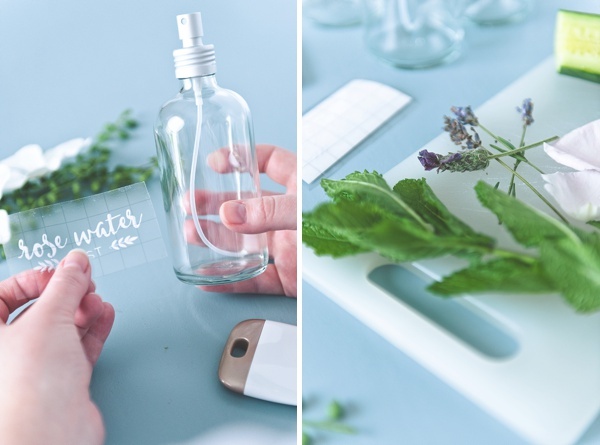 Once you have labeled all of your bottles, it's time to get all of your mist recipe ingredients prepped and ready. Decide which recipes you want to use with the information below. All recipes will use distilled water as its base. Avoid using tap water since there can be mineral buildup that could irritate sensitive skin. Using a non-serrated knife, cut thin strips of cucumber, julienne style. 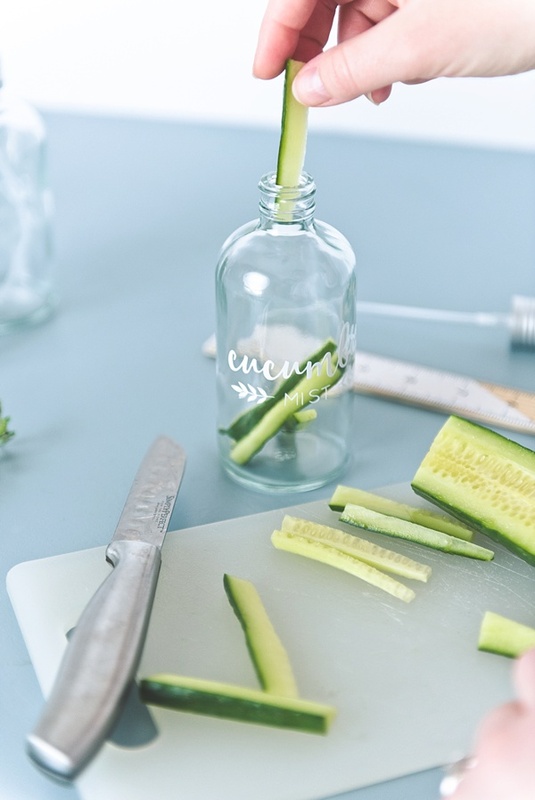 For each bottle, you can put as many strips as you'd like, but we recommend 5-7 cucumber pieces. Overnight, the water may become cloudy because of the cucumber pulp. This is okay! It's just the cucumber making itself at home. 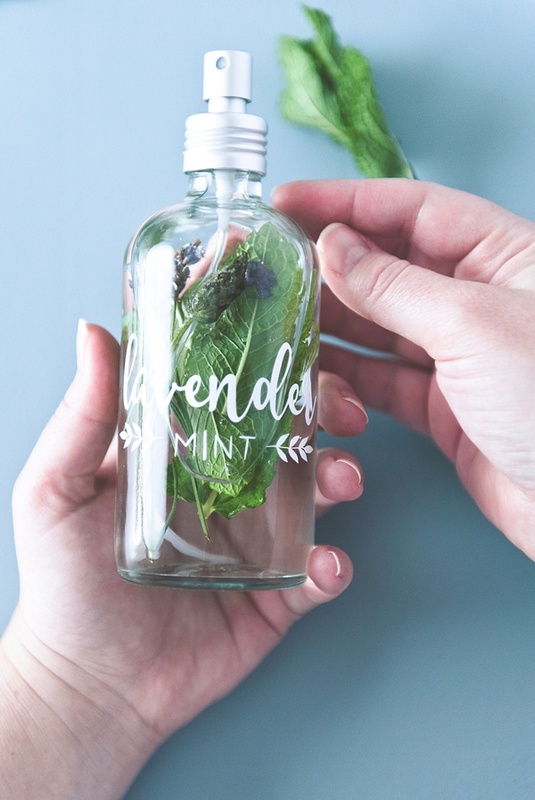 With fresh sprigs of mint and lavender, select 3 of each and place inside the bottle. 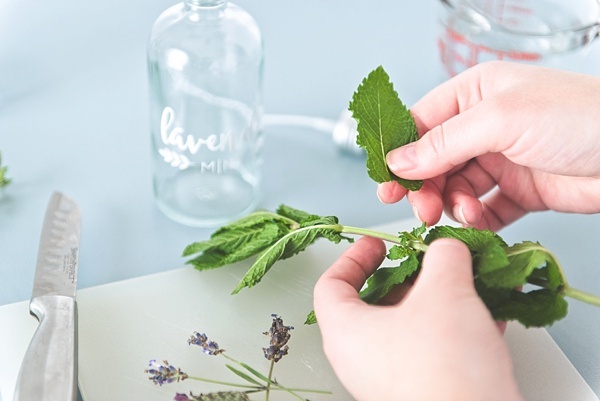 Mint can be a very overpowering scent, so feel free to use less or more depending on your preference. We literally just wanted the essence of rose water, so this recipe has only rose petals of your choice! As an alternative, you can add in actual rose water for a stronger rose scent with your petals; just be sure it is food- and cosmetic-grade. Can you tell we're pretty sensitive about skin sensitivities? Add These Other Summer-Worthy Treats to Your Cooling Station!